Take your practice to the next level with this course specifically designed for advanced practitioners/teachers. If you are already a registered yoga teacher (RYT), you will be eligible for 100 continuing education hours with Yoga Alliance upon the competition of this training. This course is part of Floripa Yoga & Kitesurf House’s 300hrs Teacher Training program, which is taught during 3 residential retreats of 10 nights/11 days at our retreat centre in south Sicily. Each module can be taken independently as a 100 CEUs course with Yoga Alliance, or all together for a 300hrs advanced teacher training course. The surf house is constituted of six rooms with private bathrooms, a common living room, a kitchen for guests on the second floor, and a barbecue. It is surrounded by a porch and a large garden, where you can fall asleep on comfortable hammocks rocked by the sea breeze, relax while reading some of the spiritual books you can borrow or watch the stars at night. All the rooms have been decorated for your comfort and relaxation with simplicity and color in a modern style. They take their names from different surf spots around the world where Ettore has surfed. With hot-and-cold air conditioners, television, refrigerator, private bathroom, Wi-Fi, you will have all the benefits of a hotel with the friendliness and freedom that only a bed-and-breakfast can offer. Ameriga's classes are a blend of Ashtanga elements fused into a Mandala Vinyasa flow style practice, with emphasis on intentional movements, playfulness, breathe work, somatic embodiment and compassionate adjustments. Her flows are intelligently sequenced to challenge the practitioners and bring them into a place of exploration of their potential. She will offer several variations for most poses, allowing modifications and personal contributions, with the idea that she is a guide, but the real teacher is the one practicing on the mat. Ameriga offers hands-on help when needed, as she believes that the personalize guidance of the teacher can lead the students in deeper expressions of the poses. (ERYT500) Ameriga's classes are a blend of Ashtanga elements fused into a Mandala Vinyasa flow style practice, with emphasis on intentional movements, playfulness, somatic embodiment and compassionate adjustments. Her flows are intelligently sequenced to challenge the practitioners into exploring their potential. Ameriga has collected over 2000 hrs of trainings in Vinyasa Flow (300 hrs with Shiva Rea, Simon Park, Meghan Currie), Ashtanga Vinyasa (with Gregor Maehle, Nancy Gilgoff, Kamal Singh and Lino Miele), Yin Yoga (with Jo Phee), Pranavashya Yoga (with Vinay Kumar). Ragusa is one of the most picturesque towns in Sicily. The view from the upper town over Ragusa Ibla on its own separate hilltop is quite breathtaking. It is one of the UNESCO-listed baroque towns of south-eastern Sicily. Ragusa is in the Monti Iblei, a large area of high ground, divided up by dry stone walls, and incised with ravines. The town was originally built on a small steep-sided hill with deep valleys on three sides separating it from the high plateau. After the earthquake of 1693, which destroyed many of south-eastern Sicily's buildings, it was decided to rebuild Ragusa on higher, more level ground nearby. This new planned town was built, with straight streets and a rational layout, but local aristocrats did not want to move, and instead built themselves new palazzi on the ruins of the old town. Nowadays Ragusa has two parts: Ibla (or Ragusa Ibla), the older nucleus on its hilltop, and Ragusa Superiore, the more modern upper town which spreads from the post-earthquake streets into more recent developments. Like all Sicilian towns, Ragusa has its share of ugly modern sprawl, but this is well away from the historic center, which is remarkably unspoiled. During this program, you will be served three daily delicious organic meals. In the morning, you can enjoy a healthy and plentiful breakfast buffet which includes fresh fruit, two cakes with one of them vegan, cereals, eggs, home-made jam, Italian coffee and cappuccino, oatmeal, different types of milk, tea, fruit juices, cereals, bread, occasionally croissants and pancakes, yogurt, biscuits, and cookies. For lunch, you can usually chose between the dishes of the day or a vegetarian buffet. Vegetarian or vegan dinners are eaten every evening together with the other guests and the Floripa team. Dinners are always vegetarian or vegan, generally presented as an healthy buffet of locally produced organic food. Gluten-free can be catered for. If there are meals that are not included in your package, then you can “pay as you go” (price ranges from 6 to 18 EUR). There are also some restaurants around 1 km away, which can be reached by bike (we provide free bicycles). Finally, there are two common kitchens that can be used to cook your own meals. The closest supermarket is located 3 km away (5 minutes by bike), and bigger supermarkets are located in Pozzallo (7 km away). Our breakfasts and dinners are buffet style, so you will find dishes that you can eat most of the time. When you sign up for meals just write a remark with your eating style / special dietary requirements and the cook will make sure to have something for you. A range of other activities is available during your holiday. Some of these options may include additional costs. The beach town of Santa Maria del Focallo is located only a few kilometers away from Scicli, Modica, Ragusa Ibla, and Noto, which are beautiful baroque cities designated as UNESCO world heritage sites, and are easily reached by car. Go on an enjoyable banana boat excursion. Floripa Yoga & Kitesurf House also has a beautiful Lomac boat that can carry up to 18 people. It is great for fishing, diving, and for those days without wind when you can enjoy wakeboarding. The boat is offered to guests at affordable prices. Take a bicycle ride around the sleepy beach town. Floripa Yoga & Kitesurf House House has 8 regular bikes (free to use) and 2 electric bikes (for rent) that guests can use every day to explore the Sicilian farms or local dairies. If you wish to adventure even further, you can also rent one of their electrical bikes. Behind the bed and breakfast lie miles of dirt roads in the countryside that you can visit freely and safely, away from traffic, enjoying the silence that only the countryside can offer. A guided tour of the cities of Agrigento and Siracusa or Catania and Ragusa, inclusive of car, driver, and local guide depending on the route chosen, is also available at extra cost. During the summer months, on the beach you will find courts for beach volleyball and tennis. You can also organize a beach football game with your friends. These courts are available free of charge for guests. The bed and breakfast environment is designed to give you maximum comfort, relaxation, and fun for an unforgettable holiday. You can bask in the warm sun and take long walks on the beach, read a book while swaying in the hammocks, or spend some quiet time in the peaceful gardens. You can learn how to surf, kitesurf, or standup paddleboard. During the week you will be notified when special workshops will be held on arm-balancing, inversions, handstand, backbends, SUP Yoga etc. These vary depending on the teachers' availability and on the general requests. You can book deep-tissue, shiatsu, hot stones and relaxing massages with local therapists for an additional charge. The garden Jacuzzi can be booked for private use or together with other guests (maximum 5 persons). From the airport in Catania the most convenient way to get to the center is to take a bus to Pozzallo- you will find the bus stop just outside of the Arrivals gate on the right, the name of the Company is AST (Azienda Siciliana Trasporti), you can only buy the ticket on the bus by paying the driver 10 EUR per person. Floripa Yoga & Kitesurf House can arrange pick-up for you at the bus station for an extra of only 10 EUR. The bus goes directly to Pozzallo and the drive takes around 80 minutes. Please note: at times this schedule can change: check http://www.aziendasicilianatrasporti.it for the updated timetable. If you take the bus from Catania, please let Floripa Yoga & Kitesurf House know your arrival time and which one you think you will be taking. Once you have actually boarded the bus please send a message or call Floripa Yoga & Kitesurf House so they can organise your pick you up at the bus station in Pozzallo (shuttle costs 10 EUR). Alternatively, you can book a pick up service through Floripa Yoga & Kitesurf House (70,00 EUR for a standard car). If you have booked it already, kindly confirm your flight number and landing time once again to Floripa Yoga & Kitesurf House. The driver who will wait for you will have a sign with your name. From Comiso airport you can book this shuttle service: Comiso shuttle, it’s available online at http://www.comisoairportshuttle.it It’s 22 EUR per person to Ispica but if you add an extra 8 EUR they take you directly to our B&B - you can write in the remarks that you need to go to Floripa Yoga & Kitesurf House in Santa Maria del Focallo. They have been here before. Or if you prefer we can send a private shuttle (it costs 60 EUR one way). If you have booked it already, kindly confirm your flight number and landing time to Floripa Yoga & Kitesurf House. The driver who will wait for you will have a sign with your name, but in case you have problem finding him, please call Floripa Yoga & Kitesurf House. Once you exit the airport, take the road towards Syracuse Primosole. Continue on the ring road until Highway A18, and take the Rosolini exit. At the exit, go left until the first roundabout, and turn left again. Merge onto Highway 115, and follow the signs to Ispica-Ragusa. At the Ispica roundabout, leave Highway 115, and take the second exit to Pozzallo. After 800 meters, turn left at the Focallo Santa Maria del Borgo Village Marisipica sign. Turn left again along Road 67 for 2 kilometers. Turn left at the sign indicating SP67. Turn immediately right, and at number 5 you will find the Floripa Yoga & Kitesurf House. Floripa Yoga & Kitesurf House can provide a shuttle service to Pozzallo / Ispica for an extra costs of 10 EUR. Please contact Floripa Yoga & Kitesurf House for more information. The nearest port to Floripa Yoga & Kitesurf House is located in Pozzallo where there is a stationary connection with Malta. Another important port not too far away is Catania, 110 kilometers from the hotel. Airport: Catania–Fontanarossa Airport Airport transfer available: Catania–Fontanarossa Airport (US$79 per person) Additional charges may apply. You can request this in the next step. 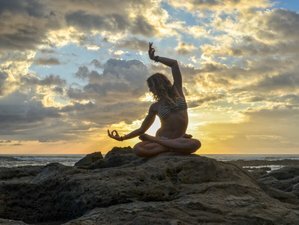 Floripa Yoga & Kitesurf House have created a holiday center which offers different activities centered on psycho-physic wellness and contact with nature. The full amount is non-refundable for cancellations happening 7 days prior to the arrival day.